Instruction to students: This is an individual piece work. 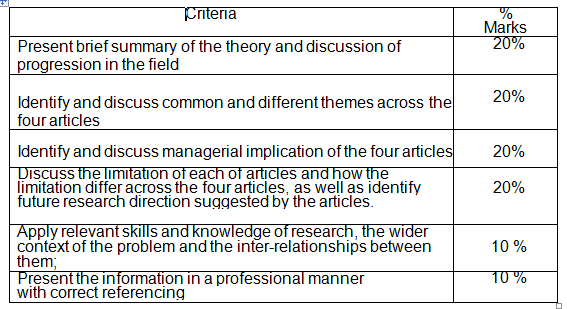 This assessment is designed to allow students to identify relevant sources for their research and undertake review on a theoretical concepts/constructs that has real world business implications. This assessment relates to Learning Outcomes a, b and d.
Study limitations and future research direction proposed in the four articles. Late penalties and extensions: An important part of business life and key to achieving KOI’s graduate outcome of Professional Skills is the ability to manage workloads and meet deadlines. Consequently, any assessment items such as in- class quizzes and assignments missed or submitted after the due date/time will attract a penalty.Penalty for written assessment is – 5% of the total available marks per calendar day unless an extension is approved. Applying for extension: If students are unable to submit or attend an assessment when due, and extensions are possible, they must apply by completing the appropriate Application for Extension form available from the Student Information Centre in Moodle, the KOI Website (Policies and Forms) and the Reception Desk , as soon as possible but no later than three (3) working days of the assessment due date. Students and lecturers / tutors will be advised of the outcome of the extension request as soon as practicable. Appropriate documentary evidence to support the request for an extension must be supplied.Please remember there is no guarantee of an extension being granted, and poor organisation is not a satisfactory reason to be granted an extension.